Team Nottingham will once again head to MIPIM, the world’s largest property event in France next month (12-15 March). Team Nottingham will be highlighting key sites and development opportunities particularly in Nottingham’s Southside at the expo – promoting the city to potentially thousands of investors in the space of a few days. In 2019, MIPIM celebrates its 30th anniversary and is set to welcome some 25,000 delegates from more than 100 countries. Lorraine Baggs head of inward investment at Invest in Nottingham, said: “Nottingham is embarking upon one of the largest regeneration programmes of any UK city, with plenty of opportunities for further development available. The City Council have invested heavily in Southside already with the renovation of the station, extended the award-winning tram system, the Broadmarsh shopping centre and enhanced public realm. This investment has had a catalytic effect on driving further interest and investment into the area. The recent announcement of the ‘game-changing’ investment in a new regional public sector hub at Unity Square, opposite the Station, will support 4,000 jobs in phase 1 alone. The Council will be looking for development partners to bring forward a number of other schemes. “For Team Nottingham, MIPIM provides a fantastic platform for us to collectively target specific individuals and companies who we could work with to bring forward some of the potential development schemes we have. 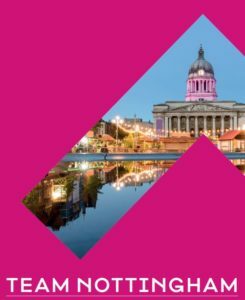 Once again, Nottingham will be part of the Midlands UK Pavilion at the property fair. The Midlands Pavilion was first introduced at MIPIM in 2017 and has gone from strength to strength, welcoming thousands of visitors each year to learn more about what is possible for investors and developers in the Midlands. Baggs added: “By bringing together the cities from across the East and West Midlands in the pavilion, we are able to work together to develop an interesting and engaging programme of events and give potential investors the chance to understand more about the region as a whole and the exciting opportunities available to them here.